Nikki McKenna: This place is just as lame as I remember. There’s not even a burgeoning slum anywhere. So vanilla. Bart: Why’d you even bother coming back then? Nikki McKenna: Not to talk to you. Nikki McKenna: *scoff* I’m here on official business if you must know. Nikki McKenna: Skate the Date is the biggest skating competition in the world! I’m going to win it this year! Bart: I didn’t know we hosted international events. I thought the only thing hosted here was rehab for washed up celebrities. Nikki McKenna: I figured you wouldn’t understand. Get out of my way, I need to practice. Bart: Pff, you probably don’t even know what a double-Rubik’s-candle-toe-flip is. Nikki McKenna: Sure I do! Bart: I just made it up! Nikki McKenna: Come on Nikki, you can do this! It’s just a simple 720 backflip with a twist! Bart: I can help you practice. Having a skating buddy will take some of the pressure off. Nikki McKenna: Wow, this is a lot easier with a partner! I guess Bart was right. But you didn’t hear that from me! Milhouse: I didn’t hear anything, I’m too focused on not falling! *face plants* Ow! I think I fractured my inhaler-ing arm. Kent Brockman: Skate the Date is finally here! Neglected youths everywhere are gathering for what will be the best day of their sad delinquent lives. Nikki McKenna: I can’t believe I’m actually here! Breathe Nikki, I can’t get overwhelmed with emotion. Oh my gosh is that Tony Dove!! Bart: Hey, Nikki. I guess we’re going to be competitors now, that’s too bad. I am going to hate making you cry. Nikki McKenna: You entered the competition! I’m…conflicted. I want to destroy you in the contest but I’m also happy we are doing this together. Kent Brockman : Well ladies and gentleman, but mostly just frat dudes. It was extremely close, but your winner is…Nikki McKenna!! Bart: Congrats Nikki, you deserve it. And I guess second place isn’t so bad. Nikki McKenna: Second place?! You came in dead last! Even Moleman beat you! Hans Moleman: I let the skateboard ride me! Nikki McKenna: Looks like you’re not as good as you think! But since I’m stuck in this dump of a town, I could show you a few moves. And this concludes the premium questline for Week 3 of Love, Springfieldian Style! Thoughts on the questlines? Did you buy Nikki? Thoughts on the dialogue? Sound off below, you know we love hearing from you! 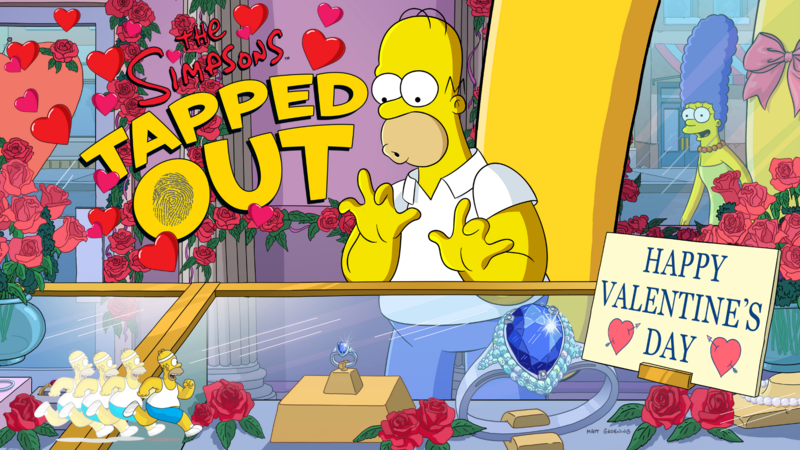 This entry was posted in Tips and Tricks, Updates and tagged 2019 Valentine's Day, Annual Skate Tour Questline, Love Springfieldian Style Event, Nikki McKenna Questline, Tapped Out Tips and Tricks, The Simpsons Tapped Out, TSTO Act 3 Questline, TSTO Addicts, TSTO Love Springfieldian Style, TSTO Tips and Tricks, TSTO Valentine's Day Event, TSTO Week 3 Premium Questline. Bookmark the permalink. Can someone help me, I finished the quest on Rome-Eh & Julie-Aye Pt. 5 but I did not get the last prize, character Groundskeeper Wilma. How do I get her? I’m 99.999999999999999999% sure you didn’t finish the quest. Scroll up in the task box, I guarantee you that you missed the task for Willie associated with part 5. Thank you so much, I did miss Willie’s job. I got her unlocked now!! Damn. I paid for someone who ditches school. I feel dirty. Bought Nikki. Another kid is always nice. Another one of Bart’s love interests too – I think we just need Darcy from that group? Good animation, on the last task, make Nikki and Bart shred, pity theres only one I can see doing that animation, would be good to see the both at the same time. Me too, was hoping they would skate together, but I have Nikki in the pool and Poochie on the half-pipe…so pretty active as it is😁.